Pictured: Student from Hilton High School manning the phones during one of our TV pledge drives. 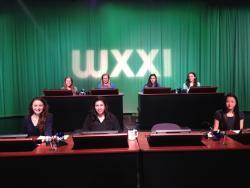 Learn more about WXXI and the Little Theatre and the many volunteer opportunities we have throughout the year. During our Volunteer Orientation on Saturday, August 13 from 10 a.m. to 11:30 a.m. you’ll have a chance to take a tour of the station, hear about our volunteer opportunities, meet other like-minded individuals, and enjoy light refreshments. Can't make August 13? A second orientation will be held on Tuesday, August 16 from 5:30 p.m. to 7 p.m.